2013 was the year we finished our basement. It’s so lovely to have that space finished, now.
. 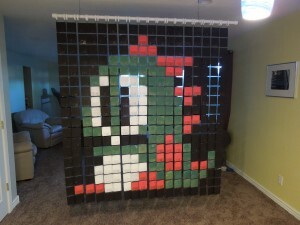 I love how it turned out, and look forward to when we can do the tile in the bathroom. No, it’s not totally done, but it’s mostly there, and we love it. 2013 was the year we took Larissa to Disneyland, and she got to go to California for the first time ever. 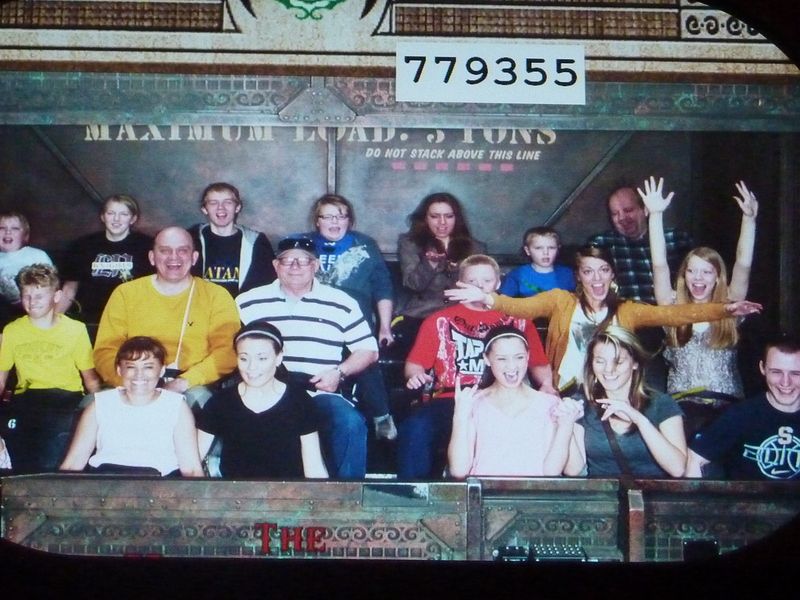 What a fun family vacation that was, and how blessed we were that ALL the kids got to go. In February we found out where Cole would be serving his mission, in West Virginia. In March, my little chime choir got to play at the spring ring, and it was a big boost to my program. After that performance, the parents really got behind my effort to purchase my own set of chimes, and the kickstarter fundraiser was a success. We got enough pledges to buy a 3 octave set of chimes. We also took family pictures and proceeded to get Cole ready for his mission. Spring was a time of many birthdays. Cole turned 19, Larissa turned 16, and Megan turned 17. We hosted our share of parties. 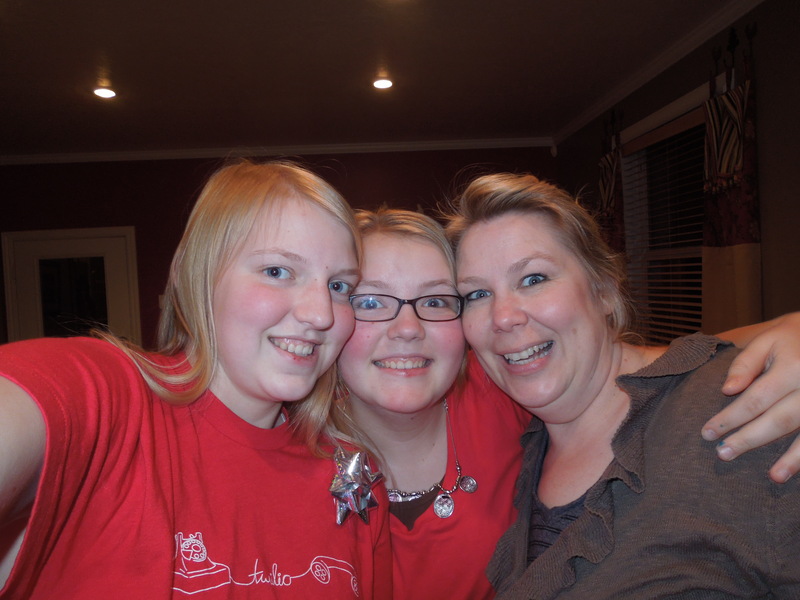 We didn’t go anywhere exciting for Spring break, but we still had some fun around here. 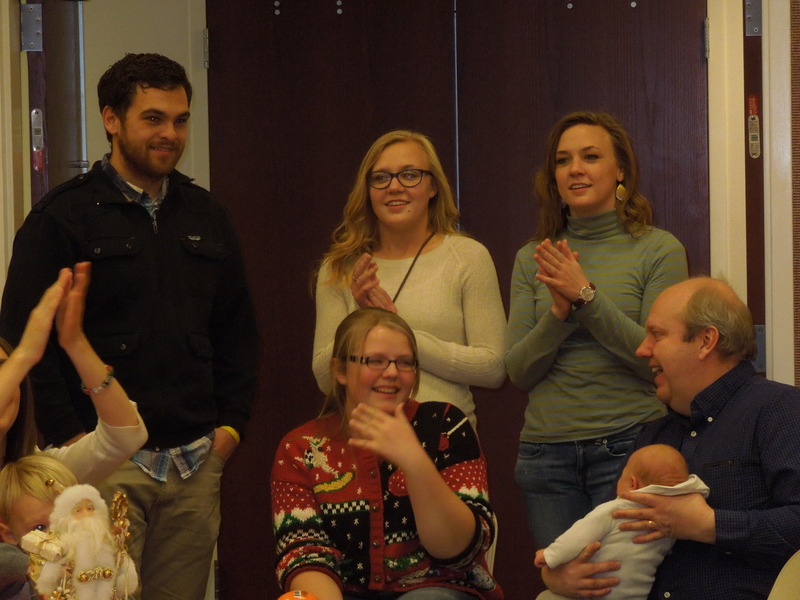 Natalie sang in a special choir for the YW broadcast and we all went to the conference center to hear her sing. May was a BIG month for us. Cole went through the temple, and got ready for his mission. He entered the MTC on May 22, and it was heartwrenching, yet happy and exciting to take him to the MTC. They also started work on the development that is going in behind our house, took out the trees, and started cleaning things up back there. It was busy with the end of the school year and all the parties, awards, concerts, etc. In June, Larissa prepared to leave us. Her Mom came over from Germany, and the two of them got to do some traveling through the west before they flew back to Germany. It was hard for her to pack up all her stuff from the whole year, and it was harder to say goodbye. We all had such a wonderful experience with her here, it was difficult to see her go. New chickens joined the family, and Cole left the MTC for his mission. Since it was summer, that meant rehearsals started, as Natalie did one play and I did another one. 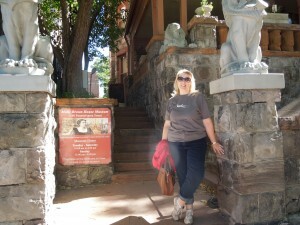 July was a blur of rehearsals, trek, exchange students from China, parties and barbeques, and family reunions. Natalie was in Peter Pan! We worked on our garden, the weather was hot, and the chickens grew up. 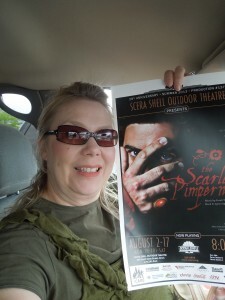 It ended with saying goodbye to a dear friend who passed away, and the Scarlet Pimpernel opened. August was wonderful. A whole month of Pimpernel. , and we ate a LOT of peaches. Oh, the peach harvest was so wonderful! We put up 50 quarts of our own peaches, and could have done many more, had we the time and energy. It’s ok to share some of the harvest, too. Ryan was so supportive and helpful, I don’t know if I could have done that show without him. It was really a special experience for me. I met so many new and wonderful people, and it changed my attitude about a lot of things. September my chimes choir started up again, and it was wonderful to not have to be trying to get a grant. I could just concentrate on teaching. The art projects started to take over much of the table and counter space. I just love this fish. 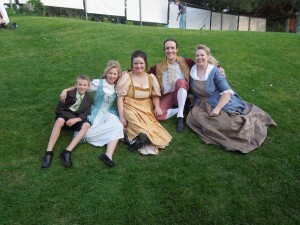 We had a small party for John’s birthday, followed immediately by a BIG cast party for the Scarlet Pimpernel. Even though the weather did not cooperate, things worked out, as they always do. Ryan’s niece got married–the first of the kids’ cousins to get married, and we are so proud of her. I also got to spend a weekend with Ryan in Denver. He was working, me not so much. Loved it! In October, we enjoyed the beautiful fall. Not too hot, and not too cold. 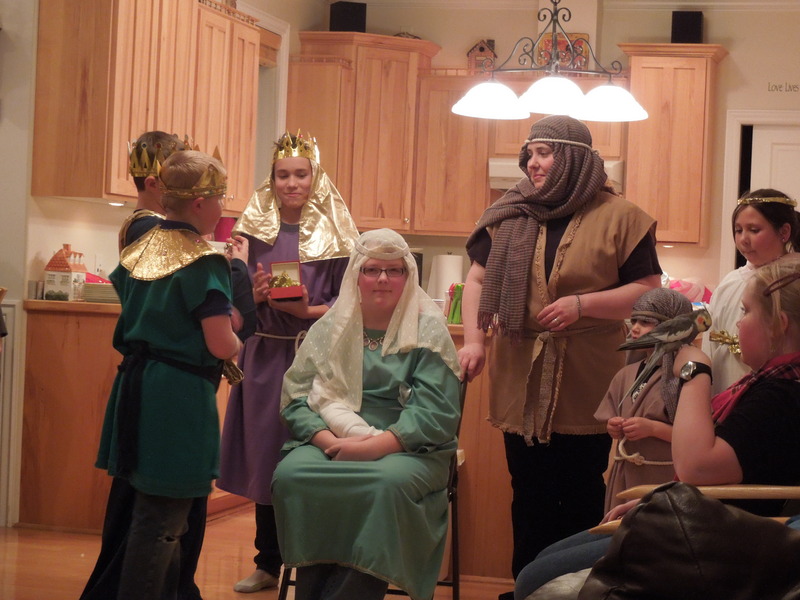 The Adventures of Merlin opened, and I learned that doing a show that performs EVERY. SINGLE. WEEKDAY. is really quite hard. But what a great experience it was. 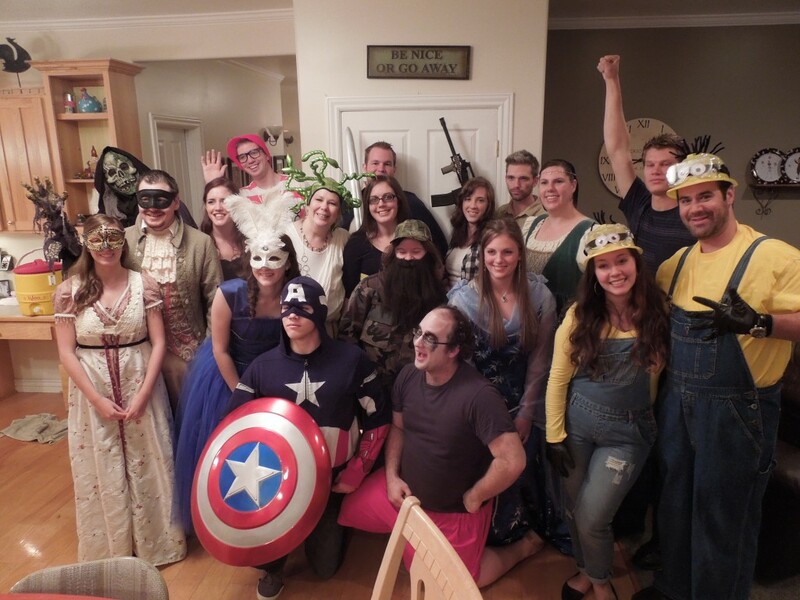 Halloween was great, the kids had fun with their costumes and candy, and we hosted a big costume party. November really kicks off the Christmas concert season around here, and so it was good that all plays were over by November 1st. The Bells on Temple Square concert was SO much fun. Thanksgiving was a smallish affair, with only 16 of us at Ryan’s sister Julene’s house. We missed Cole, but were glad that he had plenty of warm Kentucky hospitality. 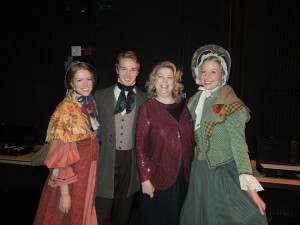 December was a whirlwind of snow, concerts, presents, and family. Meeting John Rhys-Davis was a highlight of the concert week, and it was a wonderful experience. I love all the Christmas decorating, wrapping, gift giving, baking…I love everything about Christmas! It’s sad to let it go and say goodbye to December, but I must say it was really a GREAT year. I am SO thankful for the HUGE blessings and MANY opportunities I had to expand my vision and friendships this year. I can only imagine what wonders 2014 has in store for us. Christmas day dawned bright and sunny. I LOVE sunny days when there’s snow on the ground and it’s NOT snowing. The kids agreed to wait until 8:00 am to go down, and we were grateful. 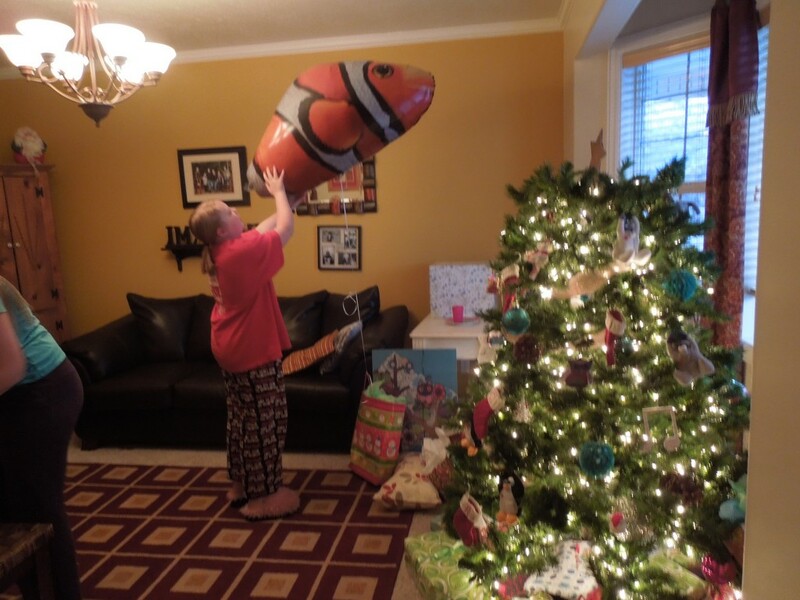 Here’s Jenna discovering the BIG inflatable remote control fish. Oh, yes, and there’s our lovely Christmas tree. Funny story about that fish. Since this Christmas we were trying to stick to a budget, I discovered quite a few presents hidden around my office, bedroom closet, and other places. 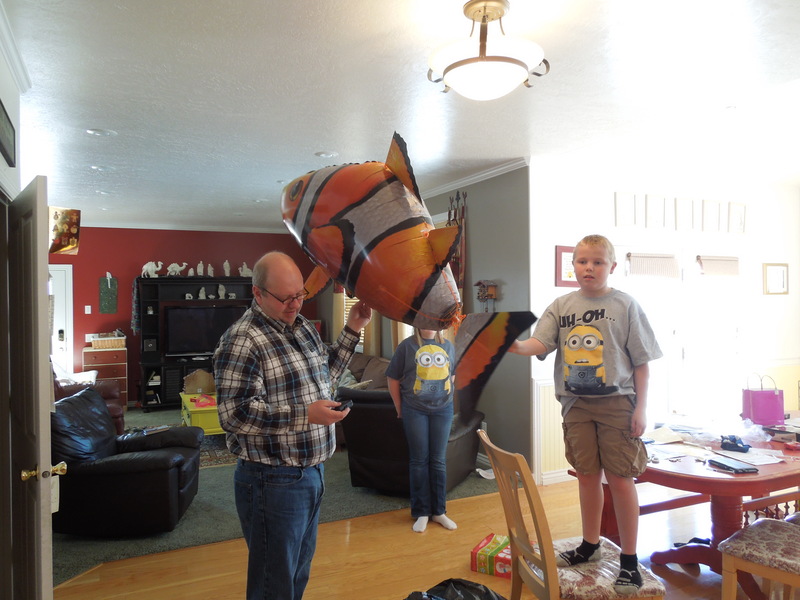 I had ordered this fish blimp last year with the intent to give it to Cole for his birthday. It didn’t come in time so it’s been sitting in the pile of unused gifts, and I thought it would be fun for John. I felt quite silly going to the local grocery store to have this huge fish filled, and of course it was windy as I walked to my car, but it was worth it. What a hit! First of all they had to build it. That took Ryan and John a good hour of working together. When it was done, we found it was a bit heavy and would only float just off the floor. Kind of like a shark. 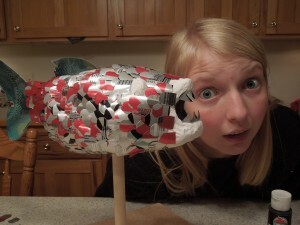 But then they experimented and took off a few fins so that it would float. Lots of fun! Natalie liked the scarf I knit for her. 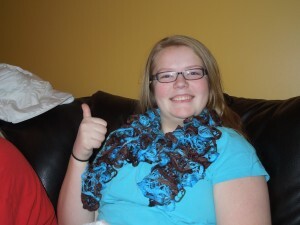 I learned how to do these ruffle scarves from a friend at bells, and I worked on my first one all during the concert week. I’m almost done with my third one. The big hit of the day was the tablet, which we got for the kids. 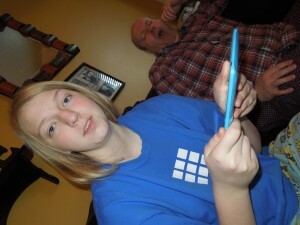 They can play games on it, and not fight so much over borrowing mom’s Kindle Fire. Yes, there have been some disputes already, but hopefully they won’t fight TOO much over it, and learn to take turns and share. The highlight for me was talking to my other kids who are far away. 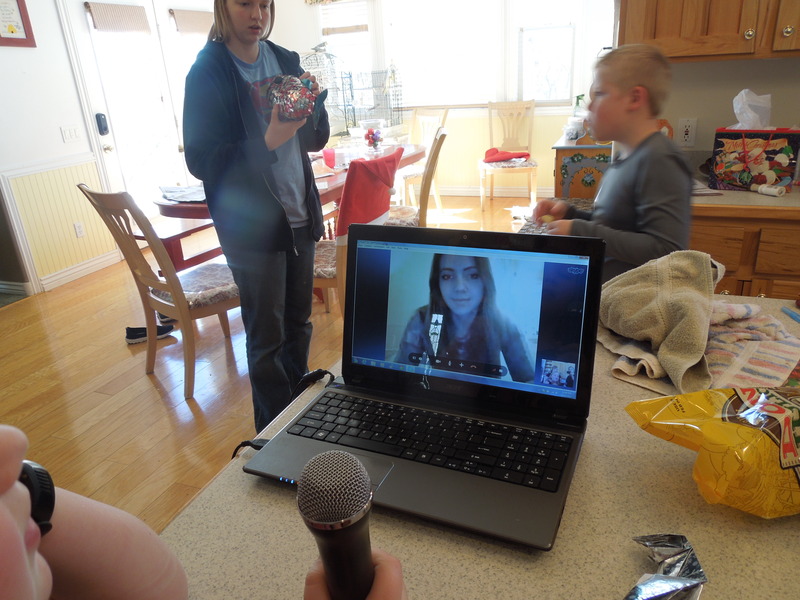 We skyped with Larissa on Christmas eve, and then skyped with Cole on Christmas. Larissa is her usual fun, bubbly self, and it was so fun to talk to her. I’ve missed her! She is doing well. She’ll be coming to visit this summer, so that will be fun. I didn’t realize how much I was looking forward to talking to Cole until the arranged time had come. He said he would call between 11 and 12 our time. At 11, we emailed him our skype password and kind of just waited. At noon he still hadn’t called. I realized I had no phone number for him, no skype Id for him, and I couldn’t contact him. He had to contact us. AT about 12:10, he sent a text and asked for our skype id. Horray! Then we tried the skype thing, and got disconnected after about a minute. WHAT? Not fair! But it’s just technology and we can deal with these things, so we restarted and dialed him up again. 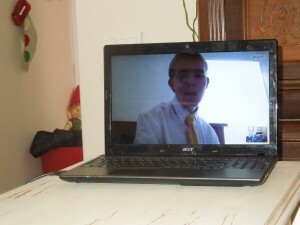 We got to talk to him for about an hour, and it was great! 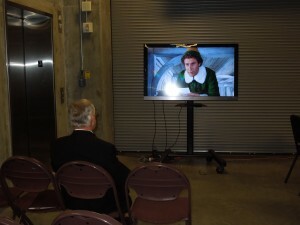 We asked about the work, what he was doing for Christmas, who he was teaching, his companion, etc. We told him everything we could think of. When I asked what mas the biggest challenge he faced as a missionary, he said it was drugs. Not for him personally, but for the people he is teaching. Many of them have drug problems, and it’s a big obstacle to feeling the spirit and wanting to change their lives. How thankful I am for the word of wisdom that teaches us not to use alcohol and drugs. Later that afternoon we converged upon my parents’ house for an early dinner. Even though it was only my sister Amy and her family, us, my aunt and uncle and my parents (which is only 9 of the 28 grandchildren), it was still pretty loud. We ate, played Bingo and exchanged gifts. Such a lovely day. Even though we didn’t have a lot of expensive gifts, our tree remained broken the whole season, and Cole wasn’t here, it was a nice Christmas. It was a peaceful Christmas. I hope we can keep that peace and joy of our Savior all year. I hope you also had a Merry Christmas with your loved ones! It was a weekend full of Family parties. ‘Cause that’s what Christmas is all about, right? Right. Saturday night we went to my cousin’s church in Riverton for the Coleman clan’s Christmas party. But first we had to stop at my sister’s house and deliver her family their Christmas present from us, and to see their brand new baby Packer. 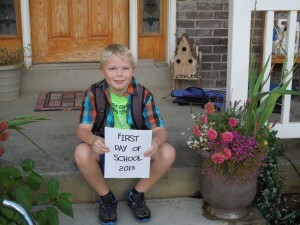 They now have 8 boys and 6 girls–crazy, right? I didn’t take any pictures of him. Forgot to bring my camera in. 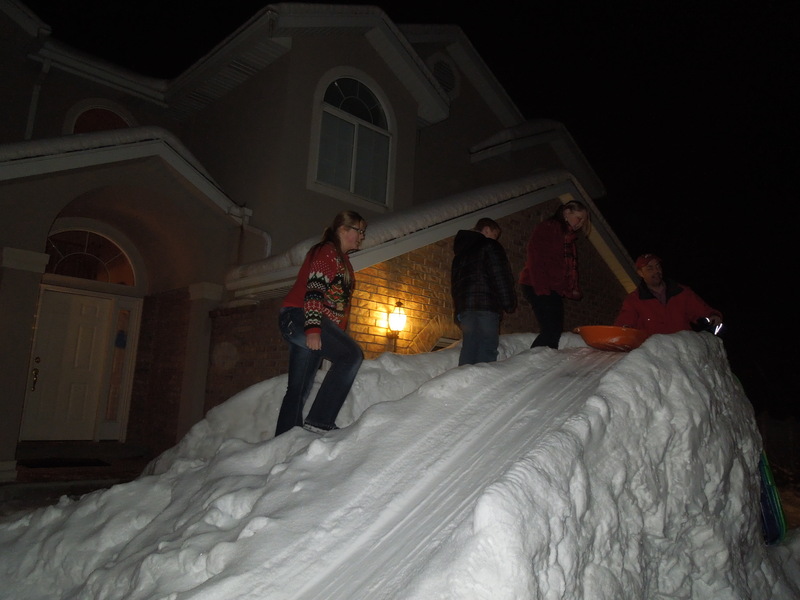 But when we got there we saw that my brother-in-law, Tom, had built his world famous snow slide. We had to give it a try. It was dark by the time we slid, so the pictures are not great, but you get the idea. 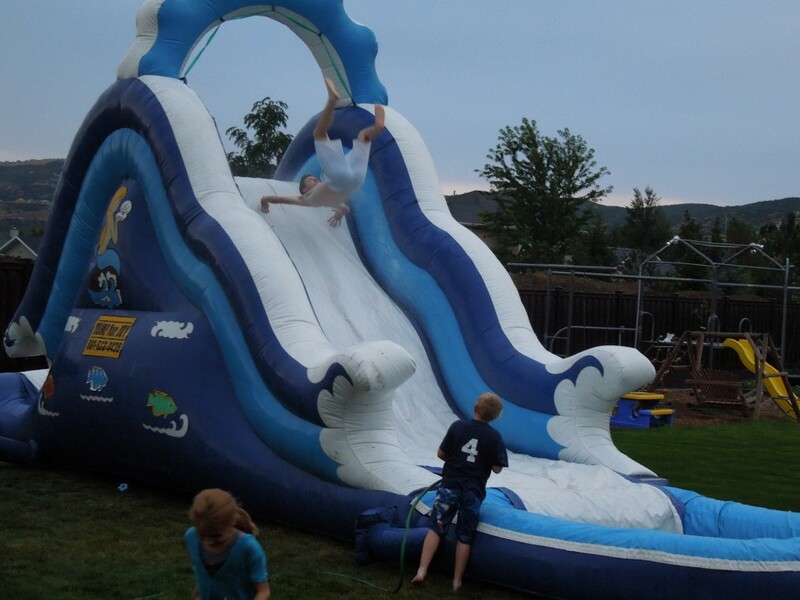 Imagine a 10 foot slide that starts at the driveway and goes across the entire front yard to the fence line. 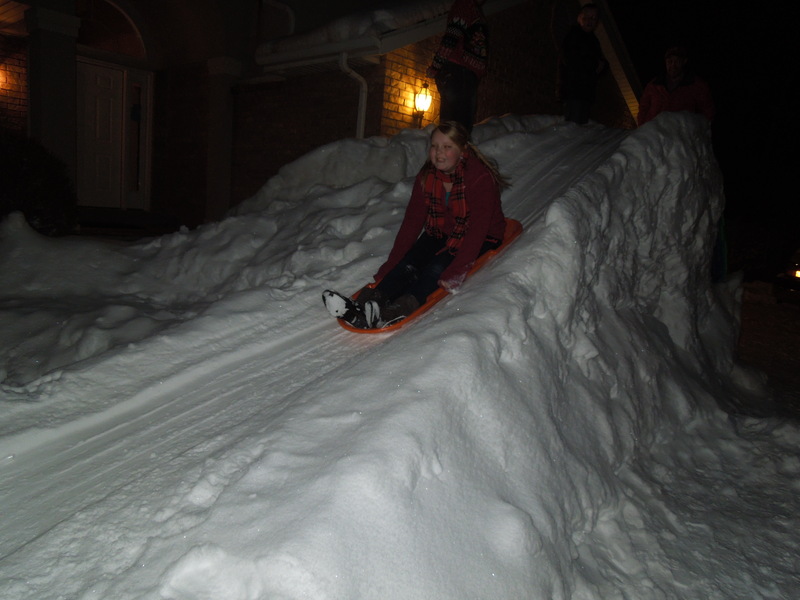 There are steps carved into the side so you can climb up, and then Tom holds the sled for you and gives you a push. We all gave it a try, even though the kids were reluctant. Of course, after they did it one time, they all wanted to go again. We’ll have to go over again during the day and with better coats and ride again. After our little snow slide, we arrived at the family party. Our family is so big that we don’t see all the cousins and aunts and uncles very often, so I really look forward to parties like this, where we can catch up, let the kids get to know their second cousins a bit, and enjoy the family. Ryan usually scopes out the new babies and holds as many as he can. On Sunday we had a busy day. I had to be up at the conference center EARLY in the morning for the Music and the Spoken word broadcast. That means getting up before 6, but it’s worth it. And the roads were clear on the way up, at least. When I got home, our church had just started. I was starving, so I thought I would just go home and grab a snack, then go. Not so. I fell asleep for a much needed nap. Good thing, because we had much to do to get ready for another family party just a few hours after church; this time for Ryan’s family. After dinner, we played a game involving paper plates and drawing. Fun. 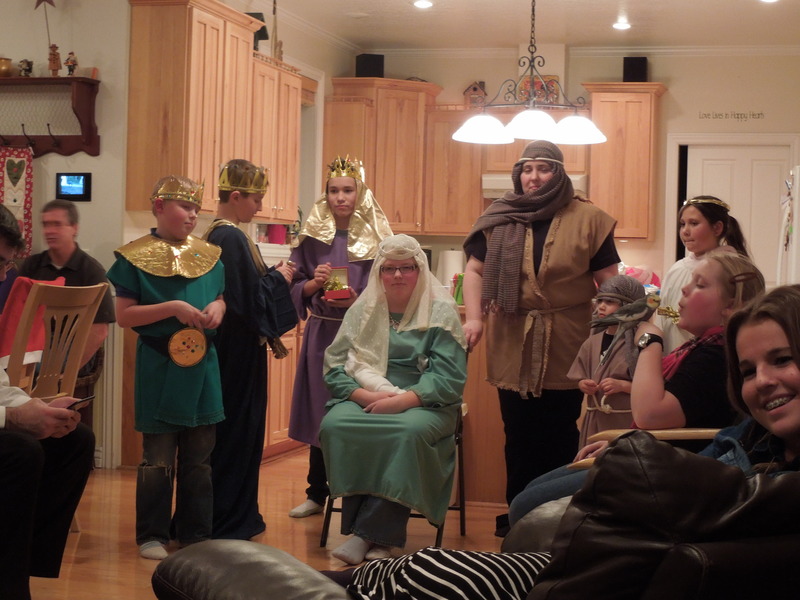 The kids are getting older and there aren’t as many who are willing to act out the nativity, but we always manage to find a few willing participants. 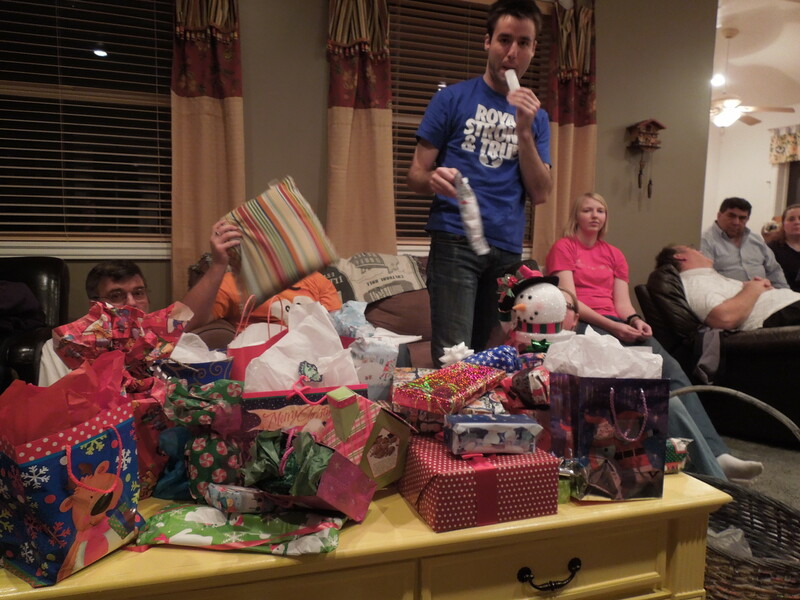 We don’t exchange gifts with cousins anymore, rather we do a gift exchange game, where each person gets to pick a present from the pile, and there are opportunities to steal. 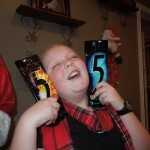 It’s always fun when a boy gets an obvious girl present, or vice versa. 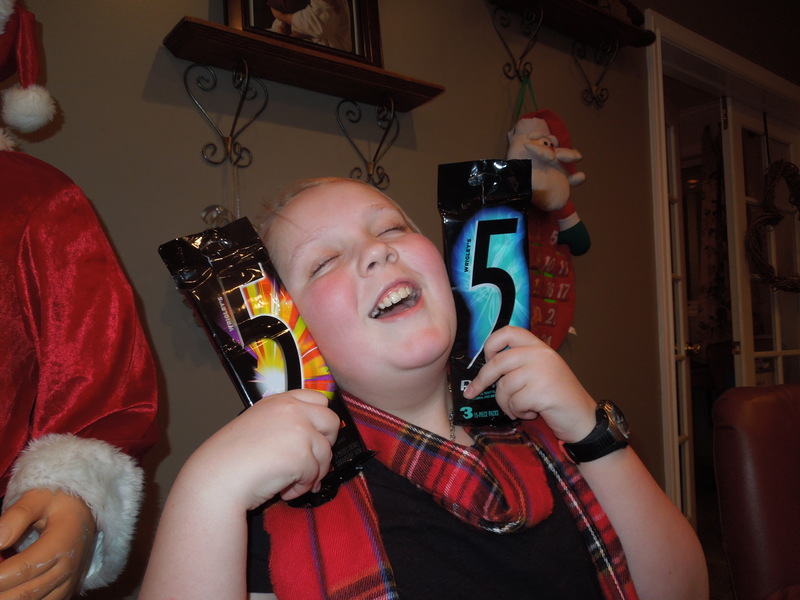 Jenna was happy when she got the packages of gum. She had to steal from someone, but she got them. When most everyone had left, Ryan’s sweet niece Camille gave our family haircuts. 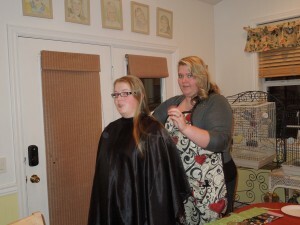 We had asked if she would bring her scissors and help us out with haircuts, and she did 5 haircuts. Only John did not need a trim, as he had it buzzed pretty short for Halloween. We are so lucky that we live close enough to party with BOTH sides of the family, that our kids can get to know their cousins, and that we have so many people to share the love with at the holidays. 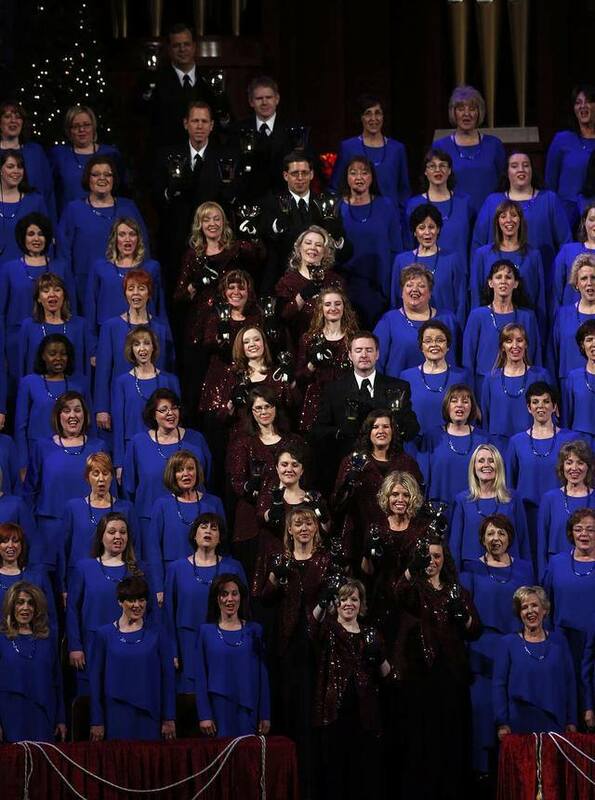 It was an amazing weekend of concerts with the Mormon Tabernacle Choir! 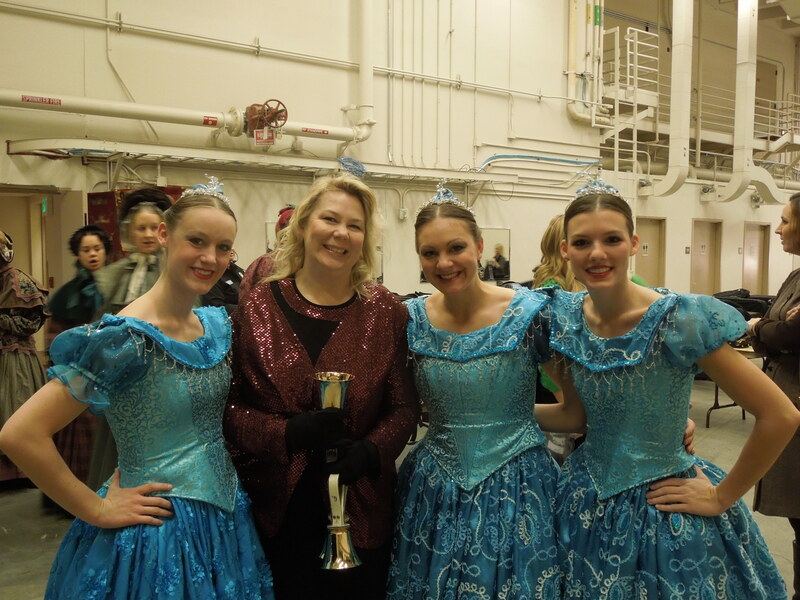 As members of the Bells on Temple Square, we like to put the sparkle in the concert. Sadly, it seems like we are leaving some of our sparkle wherever we go. We found sequins from our dresses on bells, on the carpet in the crows nest, even at the sink in my hotel room where I was staying for the weekend. It’s not like we are trying to get those sequins to come off. 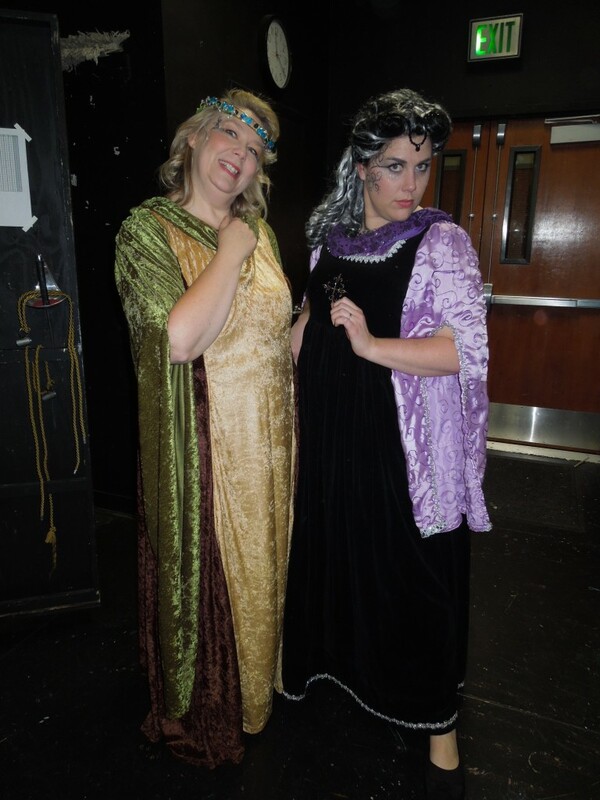 Speaking of dresses, Wednesday night’s rehearsal was fun. WE were to be dressed and ready to rehearse by 6:15. 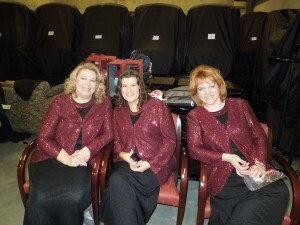 So, we got there, got dressed in our “raspberry” dresses, and walked from the Tabernacle dressing room over to the conference center. Our director was there, and when she saw the choir ladies in turquoise, she said, “Oh, this will not do! They told me they would be in Blue, not turquoise! We will clash terribly! Go back and change to black. Be back in 15 minutes.” So, we ran back through the parking garage, back up the ramp to the tabernacle, back down the stairs to the dressing room, ripped off our sparkly dresses, and put our black dresses on, telling other choir members along the way. No sooner was I dressed in black when Jenn, one of our bell ringers, said, “I just got a text. Raspberry is right. The CHOIR was wrong. Change back.” Really? Is this some kind of joke? No, it wasn’t. Sure enough, just then we saw choir members coming in to change from the turquoise dresses to the Royal Blue dresses. And we changed back to our raspberry dresses. It does look nice with the blue and raspberry. Saturday’s recording session was, for us, a lot of hurry up and wait, as we never knew if we were going to be needed for a song or not. So we would get our bells, go upstairs and wait in the stairwell for our part in the song, only to hear that they had gotten everything they needed for that song. So, we would go back and wait for stage crew to let us know when they needed us again. We did that a couple of times, and only actually played twice. 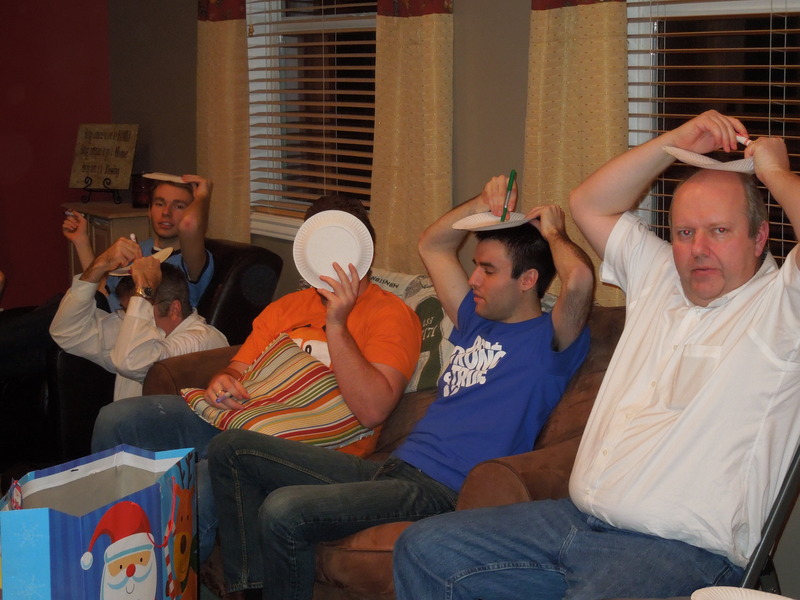 We weren’t bored, though, as we had the movie ELF to watch, and we of course had lots of snacks. 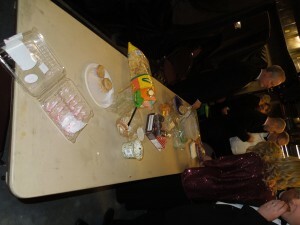 There always must be snacks at these things to “keep our energy up”. Of course, Friday night after we had put our snacks out, the men of the choir came by as they were lining up and nearly finished them all off. Seriously. The first couple guys said something like, “Wow, you have a lot of treats here!” and I think someone said, “Have a cookie,” or something like that. Soon, all the men are coming to take a donut or a cookie before they go on stage. Um, we brought those for our bell choir friends, but… We hadn’t planned on feeding half the choir, but we are happy to share. I guess. They can bring the snacks next time. To avoid a rehearsal on Wed just to come to rehearse ONE song, we dragged all the bells back over to the tabernacle during our dinner break to rehearse. The stage crew had been so nice to set up our tables and pads, so we just had to set up the bells, mallets, and music. We are playing on the broadcast next Sunday so we’ll already have to rehearse with the choir on Thursday, and we have our Choir Christmas dinner party on Tuesday, so we really wanted to avoid coming downtown on Wednesday, too. 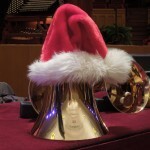 Even though it was a pain to lug all those bells over, it was worth it to avoid a rehearsal. More of a pain for some of the guys, actually. They had to carry the big heavy boxes, I just carried a little box and my music. 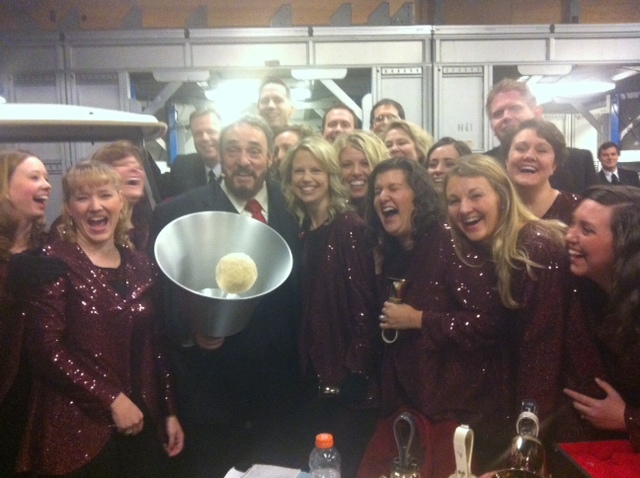 The highlight of the weekend for us, though, was when we met John Rhys-Davies. 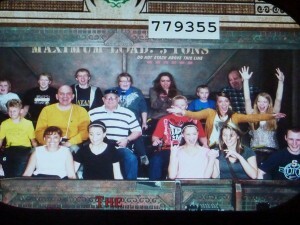 A few of our group were posed for a picture when a cart came up. John jumped out of the cart to be included in the picture! Well, then we ALL wanted a picture with him, so we did an impromptu group shot. John was so friendly and personable, we even let him hold the biggest bell for the picture. He was so very warm and gracious! What an experience! I am in the back of this group, just trying to poke my head in close enough to get in the picture. But John actually shook my hand -TWICE- during the weekend. I like to take pictures with as many different groups as I can, so here’s me with a bunch of random dancers. When I asked for pictures they were always so sweet. It’s fun talking to the dancers back stage. For the most part things went pretty smoothly. There was that time Friday night when I was on the far side of the stage in our “bunker” when the cue came to go get in place for Ring those Christmas bells. I realized it was WAY too late for me to be on that side, and I had the privilege of RUNNING down two flights of stairs, grabbing my bells backstage and then RUNNING up two flights of stairs. I got there JUST before the applause for that song, which is our cue to go up the stairs behind the choir and go on and play that song. Oh, and I tripped once as I was running up the back stairs, causing me to stumble but not fall (not like my big splat last year, thank goodness), and that one time I started the song with the bells in the wrong hands and I had to quickly figure out what to play with the bells in that arrangement. But those are just minor things. I am SO thankful I get to participate in such an amazing event every year! It’s really one of the highlights of the season for me, and even though it’s a ton of work and takes so much time, I thoroughly enjoy it! Now, I’m off to clean up my house and wrap some presents! Got some catch up to do! Another perk is that I get to participate in the Mormon Tabernacle Christmas concert, and I get tickets to give out. Even before I had my tickets, they were almost all spoken for. 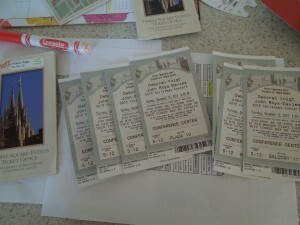 One of my friends asked last year if she could possibly get tickets, since her family had never been. We made a little trade, and she gave me tickets to Thriller, I gave her ticket to the Choir Christmas concert. My bishop also asked for tickets, and well, he’s my bishop and he does a whole bunch to take care of my family and the rest of our ward, so of course I gave him and his wife tickets. And then a dear friend lost her husband to cancer this year, and I wanted to do something nice to cheer up their Christmas, so I had to give tickets to her and her boys. Then there was MY family, and my parents. Done. Tickets gone. Then, on Monday night, as we were just leaving for my chime choir concert, my neighbor came over and returned her tickets, as her family couldn’t go on Thursday night because of family commitments. I asked her if she could go another night, or even Thursday morning, maybe I could trade with someone. There has been a LOT of trading tickets in our group. You should see our facebook page, it’s all about people asking if they tickets available for this night or that night. I thought I could trade for Sunday, as it’s usually the least popular of the concerts (although my family really likes going on Sunday morning). Luckily, I was able to trade all 5 for them, so they can go on Sunday, and I even ended up with two for another night in the deal. I offered those to another neighbor, and she was so thrilled. She also had been, and she told me that her husband is the biggest fan of Christmas music EVER, that he has something like 800 Christmas songs on his playlist. Wow! I love it when I give tickets to people and they really appreciate it. There’s nothing worse than an unused ticket or someone who says they are going to go and they don’t end up going. 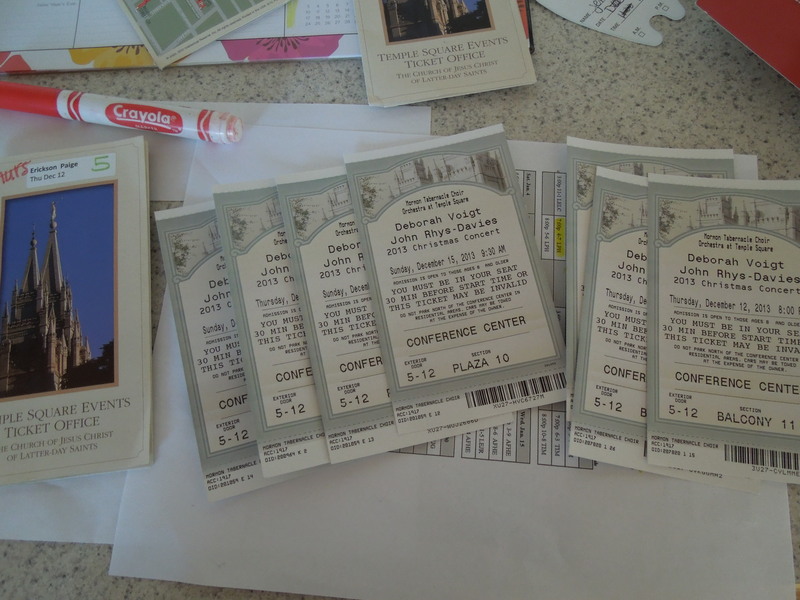 We each guard our tickets like gold and don’t give them away lightly to people who won’t treasure them as much as we do. I really wish we could invite everyone to watch the concert. But wait, I can! On PBS tonight at 11:00, you can watch last year’s amazing concert! It shouldn’t surprise me that I have awesome kids. I raised them, I know them, I live with them. I know they are amazing. But sometimes they still surprise me with their awesomeness. I read Cole’s email today and I just cried. How is it that this kid can be so sweet, so thankful, so nice? If you haven’t read it, you should take a minute and read his letter HERE. See? It’s one to make a mother cry, right? He just floors me. Anytime someone mentions missionaries, the kids turn to me and say, “Is that going to make you cry, mom?” No, you silly kids. I don’ t BREAK INTO TEARS every time someone mentions a missionary. I keep it together. Sure, I miss him and worry about him, but I don’t think about him being gone every single minute. But when he writes sweet stuff like that, yes, I cry. ARE YOU HAPPPY NOW, kids? I am thankful for the opportunity I have to be a mother. These kids are such treasures, such blessings. They teach us so much about patience, giving of ourselves, and about getting along with people. We are supposed to be teaching them, and hopefully we do that. You don’t get a lot of pay days as a parent, but sometimes you do, and it’s amazing. Saving money is hard, and it’s sometimes stressful. After figuring out exactly what to buy and what coupons to use at Walgreens to take advantage of the Register Rewards and maximize my savings, I was frustrated when I did everything right and the $10 coupon did not print out. I had to have her call the manager, then wait for a manager, meanwhile feeling super awkward as other people looked at me wondering why I’m not checking out. But when the manager finally came, she looked at my receipt and confirmed that I had indeed purchased the required amounts, (4 Pantene products and 2 Always products–the joy of having lots of girls) and it should have printed it out. She printed out not only the $10 register reward, but also another $5 coupon. So, it was like a $5 bonus. Great! I felt like my hard work paid off. Then, I was off to our local grocery store. I had counted out my coupons and written down exactly what I needed to purchase and which coupons to use. 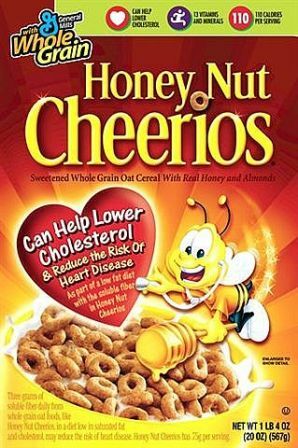 They currently have a special that if you buy four boxes of cereal, you get a free gallon of milk. I’m all over that one, and I had coupon match ups as well. I also picked up a can of mixed nuts for Ryan and a package of bird seed because I realized we were out of birdseed. SCORE! I felt like I finally did it right! Now, as long as we are ok eating cereal for every meal, we’re set for the next week! My decorating for the holidays weekend didn’t go quite as planned. Let me explain. 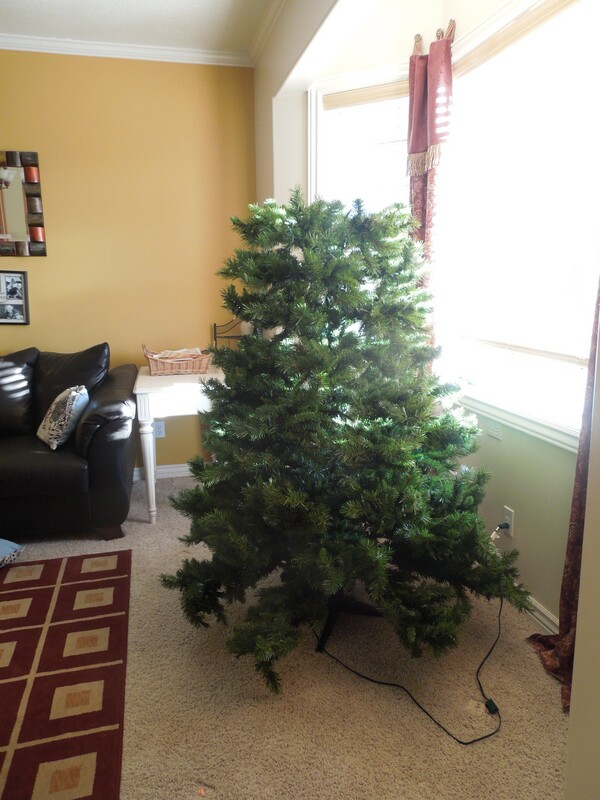 Last week I hauled out the fake tree and started setting it up in the basement. I knew there were some lights that were out last year and I wanted to get those taken care of, so I put up the bottom section and went through all the lights to make sure they worked, tweaking and adjusting as we went. I got the middle section up, but had to take off a whole string of lights and put on a new string because half the string just wouldn’t light up. I hadn’t gotten to the top section yet, and got distracted by Thanksgiving. 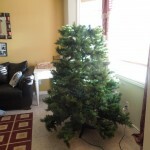 So, Friday morning, I had the kids help me haul up the tree to the living room, moving the furniture out of the way so we could put the tree in the traditional spot in the bay window. When we got the top section on, things did not look right. About half of the top branches were just hanging there, sort of limp. I took off the top section to see that the tree was broken. The only thing holding those branches on were the lights. Probably from being dropped, shoved around, or handled by kids, the tree was broken. NO!!! I don’t want to have to buy a new tree (budget things and all), and if I WERE to buy a new tree, 10:00 am on Black Friday isn’t the time to realize you need to buy a new tree. If there had been awesome black friday deals, they would be taken by now, and I hadn’t realized my tree was broken, or I would have been shopping around. Everyone knows you buy a new Christmas tree AFTER Christmas to get the best deal, right? Full of despair, I went upstairs to ask Ryan if he could maybe help with our tree. I decided to look for the lights for the house. I hauled up the huge wreath, found a bunch of other Christmas decorations in our horribly unorganized storage area, but couldn’t find the lights. I found the OLD lights that we used to use, but not the new LED lights that I bought and we first used last year. Looking everywhere in the storage area, I could NOT find those lights. I did find a bunch of stuff that I decided we didn’t need (two non working drum sets for rock band? Really?) and started filling the truck with things to go to DI. While I felt good about getting some (just a tiny fraction, really, but it’s a start) of the junk out, I was frustrated that I couldn’t find the lights. Ryan wasn’t going to get the ladder out to put up the big wreath if he couldn’t just do the lights, too. Ugh. No tree, no lights! And to add insult to injury, I kept seeing ALL these Black FRiday amazing deals, but my budget was empty for the month, and I since we ARE really trying to stick to the budget, I didn’t want to buy anything we really didn’t need, just because it’s a great deal. My day is shot. I did get out my favorite nativity and set that up, and the kids took a load of stuff to DI, but the day was kind of discouraging. 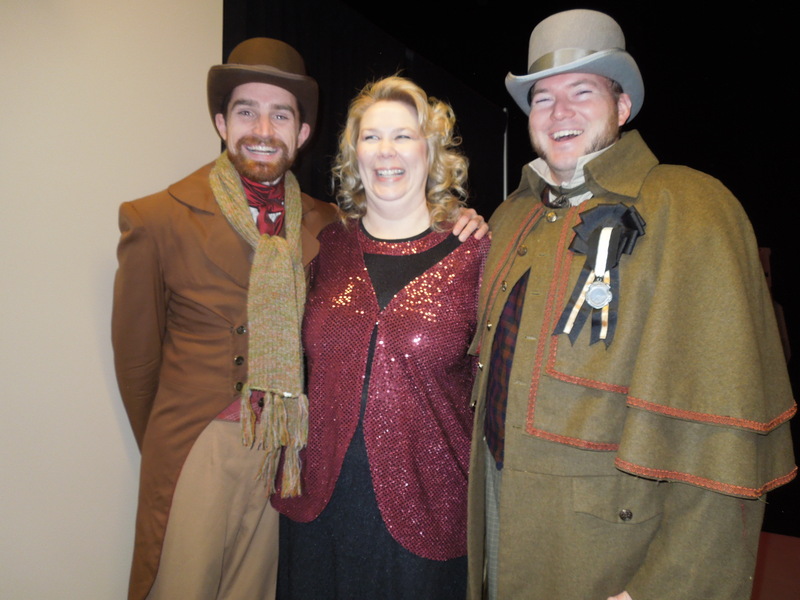 In the afternoon, a friend from Scarlet Pimpernel messaged me that she had one free ticket to that night’s preview of A Christmas Carol at the Hale Center Theater, and did I want it? (I had previously asked her about attending a preview). Even though it was just one ticket, I said I would love it. I needed to get out of the house, get away from my Christmas frustrations, and go see some of my friends in a show. As luck would have it, another of her friends cancelled, and she offered me another ticket at the last minute, so I invited Ryan to go with me. Free Date night! Can you believe I had never seen A Christmas Carol? We did that SCrooge play in Jr High and all, and I’ve seen several tv adaptations and knew the story, but hadn’t seen the play, and I was excited to see it AND support several of my friends who were in the show. I meant to take some pictures, but didn’t. 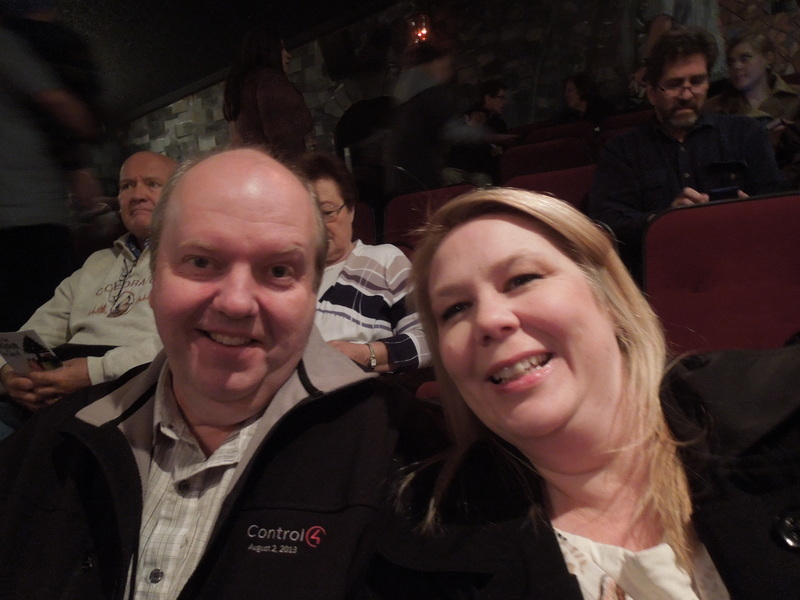 So, here’s our selfie before the show started. What a great show! Six, no make that seven of my friends were in the show that night, and it was such fun to see all of them on stage again. Plus, there were several other friends and people I knew in the audience. Ryan got tired of me telling him who everyone was, but I was just excited for them. It helped me realize that it’s not the end of the world if my lights don’t get up, and we can deal with our broken tree issues. So thankful that we got the opportunity to go before the season gets really busy. Saturday dawned with new determination to find those lights. Ryan looked in the storage area, under beds, in our closet, in every closet we could think of. Still could not find them. However, we did start putting up some lights on a couple outside trees, and got a few house decorations up. He even worked on a way to fix our struggling tree. There’s 3/4 of the tree. At noon, we were just about to leave to go to lunch with some old friends, and it hit me. I knew where those lights were. “I KNOW where the lights are!” I exclaimed. We went downstairs, and looked not in the storage area, but in the new closet under the stairs. BEHIND all the tables and chairs, were the lights. That closet area had just been finished when we took the lights off in the January or February, and I remember thinking, this will be a GREAT place to store our Christmas things. But then we bought extra tables and chairs for Cole’s mission farewell, and they found a home in that closet. Lights were buried and forgotten. Hooray! We found the lights! 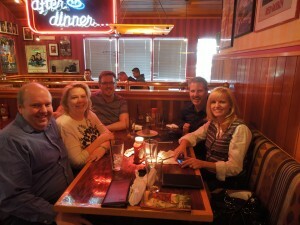 Here we are at lunch with some of my childhood friends from my ward. 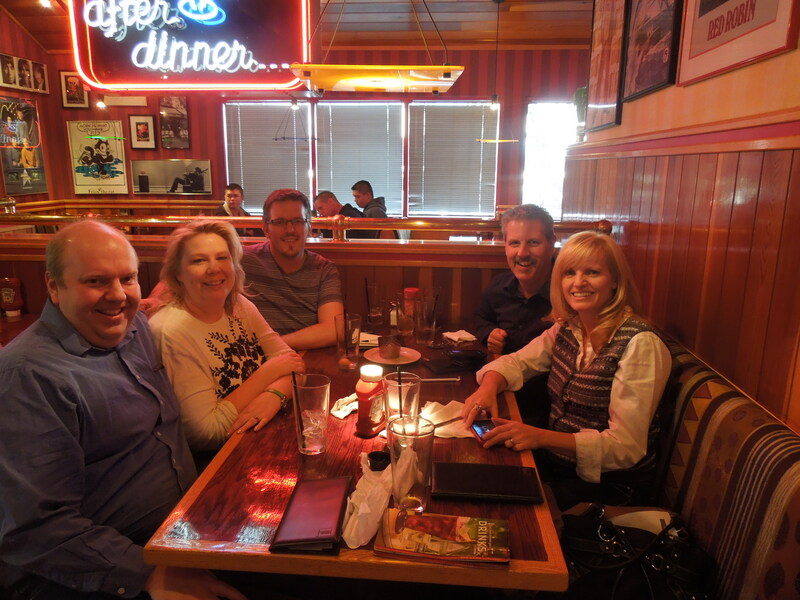 That’s Ken Clayton, Chris Cooper, Carolyn Archer, and me and Ryan. Ken was in town and organized the little get together and it was so much fun to catch up with them! After we got home from lunch, Ryan started on the lights. He didn’t actually get them up, however, because one of the strings was broken and he didn’t know we had two more boxes of lights. BUT, at least we HAVE the lights now, and can get them up soon. So, no, the lights are not up, the tree is not fixed, the house is still in chaos. BUT, we have made progress. And talking Santa? He needs to move. Right by the front stairs is NOT a good place for him. 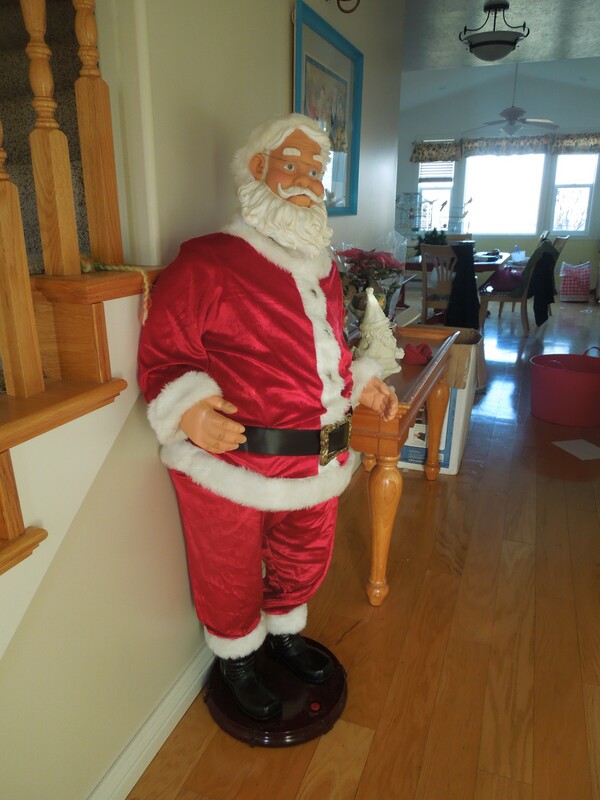 He startles us every time we walk by.